When coeliac disease ended rugby league fanatic Mark Charlton's pro-level refereeing career, he turned to working behind the scenes of the sport he loves. Now, he will look after the Papua New Guinea squad when the World Cup comes to Hull. Danny Longhorn reports. THE squads may not yet be announced for this year's Rugby League World Cup but dozens of people from East Yorkshire will play a key role. More than 70 people have been recruited as volunteers for the competition, set to take place in the UK from October. Among those is Mark Charlton, 43, of South Cave, picked as the team liaison officer for Papua New Guinea, who will be based in Hull for the duration of the tournament. He said: "Deciding to apply to be a volunteer was easy. I am passionate about rugby league, I wanted to get immersed in a team environment and I want to inspire young people to get into sport – whether as a player, administrator, match official or any other valuable support role. "I am Hull born and bred and am immensely proud of my home city. This is the chance to present Hull positively." Mr Charlton, who works in Hull City Council's adult, children and family services department, has had rugby league in his heart since the 1970s. As well as playing the sport, he has refereed Championship games – one league below the top division Super League. "After the excitement of my first team officiating debut, there was to be a twist that meant I would no longer go on to the professional field with a flag in my hand as the 2008 season was coming to a close," he said. "I had two final academy level games, the first being Hull FC v Wakefield where in minute 79, I was able to sprint the length of the field, keeping pace with a young and quick 18-year-old. "A week later, I had Wakefield v Hull KR, but it was in this game that I first experienced some problems. "I was getting severe stomach cramps, was feeling lethargic and generally not myself. "Just two weeks later, I was in the heart ward with strange heart flutters and was starting to lose weight and suffering more bouts of stomach cramps and experiencing chronic fatigue." Thankfully, the father-of-two's heart was fine and further tests on his liver also came back clear. In the end he was diagnosed with coeliac disease – a condition in which gluten found in wheat, barley causes the immune system in the gut to attack the digestive system, damaging it to a point where it affects the ability to absorb food. He said: "There is no cure for coeliac disease, it is managed through changing the diet to exclude all gluten-containing foods. "Even now, the diet goes wrong and this leaves me fatigued – and for this reason, I opted not to push my fitness and go back on-field at the pro-level. "My thinking was that if I was due to officiate on a Sunday and my diet went wrong on a Wednesday, I would be withdrawing from the game at short notice – not the right approach in professional sport. "So with my on-field days over, I had to be involved in the sport that has been part of my life since the late 1970s. "The opportunity to become a match commissioner came along in 2009 and I grasped it. It also meant learning a new side of the game." His role as match commissioner sees him checking the pitches are suitable and safe to play on, make sure there are all the medical facilities, doctors and necessary safety precautions in place at matches. He is also one of the 1,000 people to take on volunteer roles at the Rugby League World Cup, taking a month off work to look after Papua New Guinea. "I'm really looking forward to it and feel lucky that I am one of 14 people getting the chance to be a team liaison officer," he said. "It is a great opportunity to spend time with the team, see the environment and how they prepare for games. "I have already started revising about their languages and cultures and look forward to showing them our local culture here in Hull." More than half a million people are expected to watch the 28 matches live over six weeks in autumn. Hull was one of 34 bids, comprising 30 stadia, 47 team training sites and 87 team base camps, that were submitted to the Rugby Football League. Councillor Terry Geraghty, Hull City Council's portfolio holder for public health, said: "Rugby League World Cup 2013 is the next major sporting event in the UK and is fantastic for Hull to be hosting three matches at the MS3 and KC stadia. "We hope the games will bring many visitors to the city so they can see the many cultural and sporting places Hull has to offer as well as the economic benefits. "The volunteers will gain valuable experience and play an important role to ensure the games run smoothly and safely so that visitors can enjoy the games. "They will also be an ambassador for Hull and responsible for putting Hull on the map." Emma Neve, Rugby League World Cup 2013 tournament projects manager, said: "It's fantastic to see such outstanding volunteers emerge. "We sought to appoint hard-working, enthusiastic and passionate people to the available roles and were overwhelmed by the quality of application we received." Visit Mark Charlton's blog to read about his experiences as a volunteer. Neighbouring countries of Papua New Guinea and Indonesia will soon be connected by flights from Garuda Indonesia and at a later point by Air Niugini. JAKARTA- National flag carrier Garuda Indonesia is looking to start linking Jakarta to Port Moresby, Papua New Guinea capital city from next August. The Indonesian carrier is seeking to serve untapped markets in Asia Pacific. So far there was never a direct air connection from Port Moresby to Indonesia, despite the fact that Western Papua island belongs to Indonesia. The launching of an air route followed the recent visit of Indonesian President Susilo Bambang Yudhoyono with Papua New Guinea Prime Minister Peter O’Neill. Papua New Guinea’s national airline, Air Niugini, is also due to serve the same route connecting Soekarno-Hatta International Airport to Port Moresby International Airport but no date has so far been advanced. Garuda will first offer two weekly flights on the Jakarta-Denpasar-Port Moresby route. “Pacific nations such as Fiji have been hoping for a flight serving the region. "There has been no direct air connectivity [from Jakarta to Pacific nations], so the flight to Port Moresby will serve as a bridge to the Pacific islands,” indicated Indonesian Transport Minister Mangindaan to local media. The new venture could also foster a new era in tourism with common products between Indonesia West Papua and PNG. According to Indonesia Tourism and Creative Economy Minister Mari Elka Pangestu, plans now exist to expand the boat race ‘Sail Raja Ampat 2014’ to Papua New Guinea. The Minister indicated to media that they were still some security and trans-border issues to be solved between both countries. Another boost for tourism would be to provide flights between Port Moresby and West Papua regional capital Jayapura. Qantas Freight announced it will introduce a weekly freight service between Australia and Papua New Guinea commencing 6 July 2013. The flight between Cairns, Brisbane and Port Moresby will be operated by a Boeing 737-300F aircraft, offering 15 tonnes of cargo capacity each way. Qantas Freight Executive Manager Lisa Brock said the export market between Australia and Papua New Guinea was strong and our new dedicated freighter service would provide much needed capacity on the route. “This is a popular freight route with increasing volumes of freight in both directions, particularly for seafood, general cargo, mining equipment and machinery,” said Ms Brock. The B737-300F will come from Qantas Freight’s existing fleet with additional flying time made possible through schedule enhancements. It adds to a network of dedicated freighter operations between Australia, mainland China, Hong Kong, the USA and New Zealand. Qantas currently offers cargo services on Air Niugini’s daily service between Brisbane and Port Moresby. Qantas Freight has a fleet of 13 freighter aircraft including three B747-400F aircraft, one B767-300F aircraft, four B737-300CF aircraft, four BaE146 type aircraft and one SAAB 340. Qantas Freight also carries freight on Qantas and Jetstar domestic and international passenger services. In April, Qantas announced plans to lease a new B747-400ERF freighter aircraft for its global freight business. The story of Swiss nuns, Sister Lucas, Sister Damencina and Sister Meier leaving Det, Southern Highlands and Papua New Guinea after serving the remote communities of Papua New Guinea for many years, touched my inner most being especially on the same week of Government House conducting the Investiture Ceremony. Together they have served, nurtured, trained and led hundreds of young men and women in their more than 40-plus years of respective services. As seen from a photo that appeared on The National, June 20, 2013, they were all smiles, happy and healthy as if they were returning home from a short siteseeing tour. These all smiling nuns were returning home after continuous service of more than 40 years each under their belts. Forty years ago, they left behind their sealed roads, furnished homes with lights, water and almost everything you may imagine in developed Western world to come serve in a place so remote, mountainous and infested with diseases. They persevered in the 40 years, and yes, they conquered their dreams, 'TO SERVE THE NEEDY', yes they did serve my people. Coincidently, a late Catholic Brother, Andrew Simpson, died in Madang on the same week. He too had served PNG in many ways as was witnessed at his funeral procession. What fascinates me is the difference between these selfless missionaries and their priceless services harnessing, training and imparting lifelong skills to thousands of Papua New Guineans. On the other hand 'fly by night' foreign businessmen with questionable characteristics, public servants and breast beating politicians top the Queens Medal awards list year-in year-out. We all as always seem to think it’s the Government’s prerogative but who really deserves on merit these awards? Would it be those of us who work for money or those chest beaters or these missionaries of all denominations? I salute you my beloved Swiss Sisters and late Brother Andrew Simpson for all your good deeds that go unrecognised by many selfish people here on earth. Truly your Knighthoods, Medallions and Crowns await you in HEAVEN. In 2008, then-prime minister, Kevin Rudd, visited a health clinic in PNG's Eastern Highlands just as a baby was born. The parents named the boy in honour of the visiting prime minister and Kevin Rudd Junior has since become a minor celebrity. Rio Tinto Plc (RIO), the world’s second-biggest mining company, won dismissal of a lawsuit in the U.S. accusing it of contributing to genocide in Papua New Guinea. NIMBIN'S Rainbow Power Company has signed a deal to provide renewable electricity to more than 3500 homes in 49 villages in Papua New Guinea. Only 20% of the country has access to electricity, but Rainbow Power director Paul O'Reilly said there was a huge opportunity for the company there as the country had a target of providing electricity to 80% of the population by 2020. "The alternative technology skills we have been practising in this part of the world for 25 years are really coming to fruition and have a place in the broader world," he said. LIFE CHANGING: Rainbow Power Company company director Paul O’Reilly with examples of the company’s product that will be exported to Papua New Guinea. "We're now exporting those skills." Each of the 49 villages will be provided with a three-phase solar system with battery storage that will be distributed via a mini grid. The 13.8kW system will allow homes to run lighting, televisions, phone charging and a community cool room. Those too remote to connect to the mini grids will get a 90-watt stand-alone system. At the moment most villages use kerosene lamps for lighting which is responsible for health problems including respiratory infections, lung and throat cancers, eye infections and cataracts as well as low birth weights. Mr O'Reilly said when faced with a choice between diesel generators and renewable technology, renewables were now much cheaper and more reliable. "When you're looking at villages that are a five to six-hour boat trip upriver, trying to keep the diesel flow up is a challenge," he said. "So the answer is to install a system where they get free energy from the sun." He said Rainbow Power's tender included its highest quality equipment because reliability was an important issue. He said the desire for mobile phone technology and the need to recharge handsets was driving the push for electricity on PNG. "When you looking at communicating with someone for a 30 cent phone call instead of a two-day walk, that's life changing." 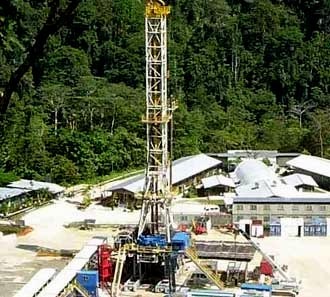 High Arctic Energy Services Inc. has accepted a Letter of Award from Oil Search Limited for three year contract extensions for its primary contracts in Papua New Guinea (PNG). The extensions will cover the drilling contracts for Rigs 103 and 104 and the drilling support services contract related to the supply of personnel and rental equipment to support the related drilling operations. The new contracts are expected to be signed early in July once the agreed terms are incorporated into the amending agreements. The new extensions will be effective July 1, 2013 for a three-year term to June 30, 2016. Essar Projects a Global EPC (Engineering, Procurement, Construction) contractor headquartered in Dubai announced that it had secured a construction project valued at US$ 50 million in Papua New Guinea for the Western Highlands Development Corporation. This is the sixth international contract won by EPL this year and the second project secured by the company in PNG, where it earlier constructed and commissioned the Komo Airport for Exxon Mobil. Essar Projects’ current order book has swelled to over US$ 4 billion. The project involves construction of Kapal Haus in Mount Hagen Western Highlands Province. EPL would design, construct and commission the Proposed Mixed Use Development project which will include construction of an office complex to house the provincial headquarters including the Governor’s office and a residential building for diplomats, ministers and high profile professionals. The project will be completed in 22 months. The Prime Minister of Papua New Guinea, Mr.Peter O'Neill will inaugurate the project next month accompanied by four former Prime Ministers in a ceremony that will be graced by the Regional Head of the Catholic Church and all foreign diplomats. FIJI’S potential as an ideal investor location was discussed by National Superannuation Fund (NASFUND) Chief Executive Ofﬁcer, Ian Tarutia, at the recent Fiji Institute of Accountants Congress 2013 held at the Sheraton Fiji Resort on Denarau Island early this month. The event has been the premier meeting ground for Fiji’s private and public sector movers and shakers for many years. Mr Tarutia was invited by Fiji’s Accounting Congress Committee following a marked increase in PNG’s institutional and private investors’ participation in Fiji. One such investment is the joint venture between NASFUND, Lamana Development and Fiji National Provident Fund in the much-anticipated FJ$90 million investment redevelopment of the 5-star Grand Paciﬁc Hotel in Suva, expected to be completed by the end of this year. Grand Paciﬁc Hotel Suva is 50% owned by NASFUND, 25% by Lamana Development with Fiji National Provident Fund owning the remaining 25%. Tarutia said that NASFUND’s Board of Directors considered three fundamental issues as part of the decision making process to invest in Fiji: i) the quality of their joint venture partners, ii) hotel management capability and iii) the Melanesian connection with Fiji. NASFUND’s ﬁrst ever investment in Fiji, the Grand Paciﬁc Hotel redevelopment, has been a catalyst of much=needed economic activity in capital Suva since works commenced in 2011. Initially built by the Union Steamship Company in 1904, this legendary and luxurious hotel has accommodated dignitaries like Her Majesty the Queen of Britain and other reputable individuals who graced Fiji and the Paciﬁc back then. The revival of one of Suva’s most iconic landmark after two decades of it closing its doors is seen by some Fijians as a sign of more grandeur things to come and with it hope that NASFUND and other PNG investors will continue with their prudent investment in other business opportunities in Fiji. Papua New Guinea's Prime Minister will discuss a possible increase in trade with Townsville during a visit to the city this weekend. It will be the first time Peter O'Neill has visited the north Queensland city. His two-day trip will include a tour through the Port of Townsville and watching a Cowboys' football game. Dawson Wilkie from the Townsville Chamber of Commerce says it is an important opportunity to develop trade relations. "We were looking to reinforce that and look at ways that we can improve that relationship," he said. "Townsville businesses do a lot of trade in PNG, there's a lot of PNG students who come to TAFE colleges in Townsville." Mayor Jenny Hill has other issues she'd like to raise. "I want to talk to him about education opportunities here as well as health opportunities," she said. She says she also wants to discuss fly-in, fly-out workers. Mr O'Neill will arrive in Townsville on Saturday. Cocoa is a lifeline for thousands of small farmers in Papua New Guinea (PNG), providing vital income for some 20 percent of the country’s population.In 2006, a devastating disease ravaged the crops of thousands of small farmers in East New Britain, the first province in PNG to be affected by the cocoa pod borer (CPB).The impact of this disease is severe. Untreated, its larvae tunnel into fresh cocoa pods and decimate cocoa harvests. Farmers here saw as much as 90 percent of their crops destroyed. Total production in the province plummeted from 22,000 tons in 2008 to under 4,000 in 2012. This left many farmers and their families without a basic income, and created a great deal of hardship. Nelson is a farmer in Vudal and cocoa is his main cash crop. In 2006, he had never seen CPB before. When we saw it for the first time, it was horrifying. We just saw the insect bites. These looked like fruits that had fallen onto the ground and had lain there for weeks. Across the province, communities describe how the loss of income left them unable to meet their daily needs, from sending their children to school, or paying for transport to get to town. Farmers went from harvesting some 15 bags of dry beans, to just one or two bags a month. Many gave up. Alois Dulia orks as an assessor at Agmark, one of the cocoa buying companies in the province. He remembers when the factory was filled with cocoa beans, and farmers were literally queuing to sell their produce. “There were farmers all the time, and we could hardly keep up with so much supply,” he recalls. Initiated in 2011, the World Bank’s Productive Partnerships in Agriculture Project (PPAP) is supporting community-led projects in East New Britain and Bougainville to help thousands of small farmers control the outbreak and restore their livelihoods. Five cocoa partnerships have been established funded under the first round of the project, helping provide seedlings of more CPB-tolerant cocoa varieties. Model farmers have received training on techniques to manage CPB, and are working with extension workers to pass on their knowledge in their communities. Measures like regular harvesting, pruning, good block sanitation and pod burial can eliminate as much as 98 percent of CPB infestation. Hosea Turburat is the manager of the Central Inland Baining Rehabilitation Partnership, part of the PPAP, which will rehabilitate 500 hectares of land. Altogether it will provide 100,000 new cocoa seedlings, for 500 farmers in the remote Bainings area. “The main advantage is to increase production, because we are introducing hybrids which are CPB resistant, and also to increase income and improve standards of living. The project is also helping farmers plant other crops such as galip nut or taroas an additional income source. Some projects are supporting local agribusiness development and marketing, especiallyfor women farmers. Funded by the World Bank’s International Development Association and the International Fund for Agricultural Development, the project is supporting coffee and cocoa farmers through eleven partnerships in six provinces to date. With growing community interest, more partnerships are in the pipeline. Another 14 partnerships are expected to be approved in the next few months. By the end of this year, more than 18,000 farmers will be benefiting from PPAP.